It happened again. I was sucked into the world of documentaries. I had heard about Farmaggedon (the documentary) a little while ago and my interest was piqued. However, my enthusiasm for educational and informative viewing material is not shared most days by those that compete for viewing time in my household. It is usually “fluff” viewing or MMA that is being watched in our home which I also love. I enjoy MMA immensely to the resounding gasps of my friends. I guess I don’t seem like the type. What is the “type” of woman who likes MMA anyway? Why must we be a certain type to have interest in MMA, documentaries, musicals, dramas, action flicks? I enjoy all of the above. Does this make me well-rounded? I decree that yes, it does make me a versatile viewer. However, the aforementioned documentary Farmaggedon was what got my attention today and has tumbled around my thoughts to the point that I have something to say on the subject. The documentary really got me to thinking, yet again, about the source of our food. Where it comes from, how it’s processed, and the regulations and laws surrounding our food industry. Of course, each country has their own laws regarding the food industry. My main points will be focused on North American food industry practices since the documentary that I have most recently watched is American. There is definitely a difference between the U.S. and Canadian food industry regulations and practices but there are many overlapping practices as well. I do not declare that I am an expert on the food industry, processing, or laws of such. I am seeing this from the standpoint of a human being. We all need to eat. From a stance of an individual that wants to know what is in my food and that the food I choose is safe, healthy and what it is labelled as being. If you have not had the opportunity to inform yourself on our food industry, I would highly recommend doing so. Perhaps you may learn a thing or two that you were either unaware of or didn’t really want to acknowledge. The need for awareness is not going to turn you into a die-hard activist (unless you choose to do so). It will merely give you an idea of what you are consuming – good or bad, healthy or not, whatever, that’s your choice. Not knowing what’s going on in the food industry than bashing those trying to make a difference is sheer ignorance and close-mindedness. I for one want to have the option to choose my food, not be dictated to and only given choices that will essentially make me a lab rat. I have always had a strong sense of personal choice from an early age. My sisters will attest to me (the youngest of three girls) brazenly spouting the phrase, “I have the right to…!” That seemed to be my most well-known tagline. I am still that same feisty girl with the desire to declare my free choice in all scenarios. However, I do not feel the need to shout it any more but firmly state my view when necessary. I know where I stand. I won’t be bullied into believing something just because I am told that I have to or believe every advertisement that appears before my eyes. I am smarter than that, thank you very much. While watching Farmaggedon it really hit home about the state of North American agriculture. I applaud farmers worldwide for what they do. Farmers are definitely some of the hardest working people on the planet. They toil each and every day in all weather conditions to put food on the table – our tables. We have allowed our farmers to be manipulated and bullied by the likes of the FDA and large corporations that are driven by profit, not supplying healthy food to folks like you and me. The small-scale farmers that want to supply people with wholesome food choices are fighting a huge battle and taking a massive hit while we stand idly by with our hands in our pockets not knowing what to do. It is essential that people start speaking up to create change in governmental practices and laws that are strangulating the only people who really can provide good food to our tables, other than ourselves – the farmer. Factory farming is a practice focused on profit and creates many issues I won’t get into. Factory farming, in my eyes, is not farming. It is mass production of an item. How easily people forget that the chicken living its life in a restricted area sitting in its own waste becomes that piece of fried chicken on your plate. All for the sake of saving a couple of dollars at the grocery store. Shudder. Simply put, for me factory farming has taken the personal touch out of agriculture. If you happen to be a factory-farmer I apologize if my words offend you but I, like you, am entitled to my opinion. I am not vilifying you per say, but the practices involved in mass production of living beings. Feel free to voice your thoughts. Just please do so respectfully. I am saddened by the thought of so many living beings treated like they are merely a dollar sign. I feel sickish inside. Moving on. In review of the documentary, I felt it weighed in heavily on the subject of raw milk farming and legislation. Perhaps I was hoping for a broader subject matter since I don’t consume milk personally but it was very eye-opening none-the-less. It comes right down to the fact that as consumers we should have the ability to purchase foods of our choosing. Of course there must be stipulations such as nothing that is endangered, for instance. If one really looks at the source of food from a family run farm as opposed to a large-scale factory operation, I think most of us would choose the former. I prefer produce from my garden over produce from a greenhouse sprayed with several rounds of insecticides and fungicides. It’s common sense, really. It is frightening that it has gotten to the point that small farms are being raided and their livelihood seized by the FDA. Why does the government feel so threatened by these small farms? Is it really in the name of consumer safety? I, for one, highly doubt it. My guess would be that the government is so tied to Big Ag giants that the government is no longer “for the people” but instead for the profit. We are at a point in history where we have all screwed up royally by trusting large corporations to dictate to the masses, myself included. Standing up to the Bully (Big Ag/government) where our food is concerned is now at our doorsteps. Being aware makes a difference. Simple steps like voting with our food budget is a great place to start. Local markets, farmers and small businesses can make a big impact. We are already seeing many large food companies trying to cater to certain markets by diversifying. It’s a small step in the right direction but it is still supporting large-scale operations. Picture yourself as a farmer trying to support your family. You want to supply people with an exceptional product that you give every waking minute to producing. The FDA steps in and claims some bogus law made in the 1930’s and seizes your animals/crops. How would you feel? Who would you turn to? The red tape is so restrictive for many small businesses that even making a profit can be a very difficult task. To sit at a desk in a cubicle somewhere and sneer at those that want to have access to real food that is grown and produced with passion and care or at the farmer themself is hypocritical. The next time you eat a burger or a salad or drink a milkshake remember that someone somewhere had to get those items to market so you could stuff your face with them. Changing our thinking process to bring us closer to the food we consume and the reality of food production may just open our eyes and our heart a little bit more. Breakfast this morning was a blissful start to the day. What could be more sinfully satisfying than a bowl of warm chocolatey, coconutty sumptuousness? A few days ago I happened upon a recipe for chocolate banana breakfast quinoa that made my taste buds dance at the thought. 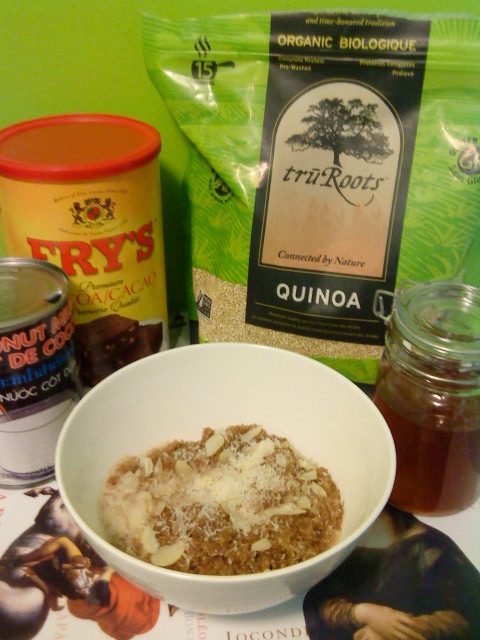 While reading through the ingredients I mentally omitted certain things and added others. The original recipe can be found here. The first ingredient to hit the chopping block was banana. Over the past couple of years I get this weird mouth-feel from bananas that makes me highly uncomfortable. Okay, that sounds kind of weird. I guess I should be more specific. I may possibly have a slight allergy to bananas or at least an intolerance since my mouth and throat get a tingly, fuzzy feel and my stomach feels as though I swallowed a bowling ball. Does that explain why the banana was axed? Instead, I aimed for pure gastronomic pleasure and substituted with coconut. Gosh I love coconut. I would lay in a tub filled to the brim with coconut milk and drink pina coladas if the situation ever presented itself. Yes, I am mad for coconut. I think I need to stop and compose myself with a sip of coffee. Or three. Let’s get down to business now, shall we? Collect your ingredients and let’s get the quinoa simmering so you can make yourself a cup of coffee while its doing it’s thing. Coconut milk – read your ingredients before buying since most coconut milk contains preservatives. Find one without if possible. Honey – unpasteurized is my preference. I want the “good stuff” that’s meant to be there. Cocoa – I am trying to use up a large canister I bought for Christmas baking. Choose an organic, fair trade cocoa if you can. 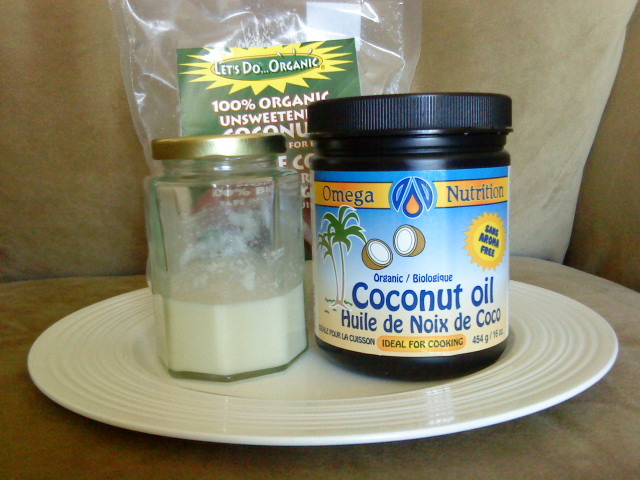 Coconut – shredded, unsweetened and preservative-free. Now that all the ingredients are collected, let’s put the quinoa on to cook. Make sure to rinse the quinoa well before using to avoid the bitter taste from the protective layer of saponin that covers the grain to repel birds and insects. Put 1/2 cup of washed quinoa into a small pot and add 1/2 cup of water, a handful of shredded coconut, and 1 cup of coconut milk. Bring to a boil then reduce heat to simmer for about 10-15 minutes. I covered the pot but you don’t need to. Watch it doesn’t boil over and make a mess of your stove top like I did. The smell of burning coconut milk is not pleasant. This is where you can make yourself a cup of coffee or tea and relax for a few minutes. When the liquid is almost fully absorbed, remove from heat. Add 2 tsp of cocoa and 2 tsp of honey. Stir well. 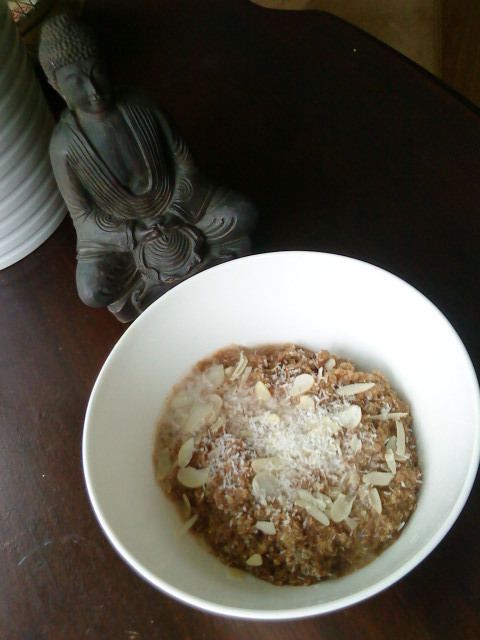 Top with a little coconut milk, shredded coconut and slivered almonds. Find somewhere comfortable to sit while savouring your morning meal. Lingering over each bite and being mindful of enjoying the goodness of sustenance makes it all worthwhile. When we rush to consume “whatever” in the morning we are doing ourselves a disservice. I know I feel so much better and more clear-headed when I sit down, put on some music or just enjoy the silence while eating instead of trying to multi-task while walking around. I love snacks but they have to be worth having or forget about it. I have learned the hard way about choosing wisely when it comes to snacking. This time of year is especially difficult for me to snack wisely since all I really want to do is what Nature intends for us to do and pack in calories to get us through the winter here in this chilly climate. I have started making my own healthy snack options for a couple of reasons. 1: I don’t want to munch on crappy junk food. 2: Eating something just because it’s “healthy” is pointless unless you actually like it. 3: Cutting out extra sugar and sodium is easy when you are the one to decide how much to use. 4: There is nothing wrong with being frugal. 5: I really, really like to cook and bake. One of the latest snack crazes that has risen to popularity in our house is Roasted Chickpea Bites. These little guys pack a serious nutritional one-two punch while satisfying the need for salty or sweet (or both). One cup of chickpeas contains 10 grams of protein, approximately 15% of your RDA of iron, 6% of your RDA of calcium, 7 grams of fibre and 0 mg of cholesterol. I’m in love. Sure the calories may be on the high side at 220 calories/cup but I’m okay with that. Everything in moderation, right? I thought you might enjoy these tasty morsels as well so I am going to share with you so you can snack-on without guilt. 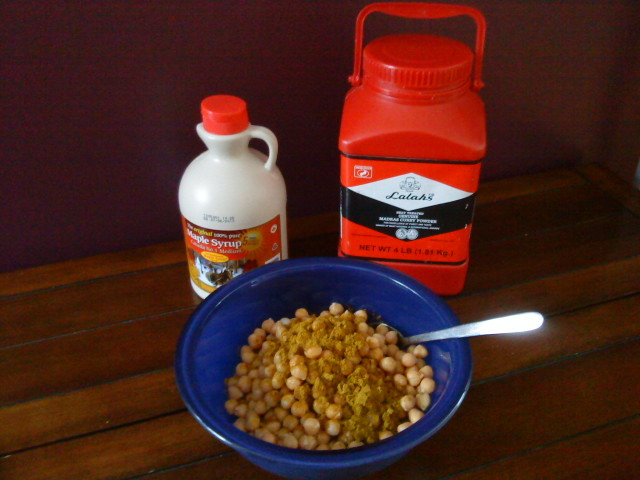 After rinsing the chickpeas well, pour them into a large mixing bowl. Drizzle with approximately 1-2 tablespoons of olive oil, add your seasonings (today I used 1 tbsp of my favorite madras curry powder and 2 tbsp maple syrup), and stir. Mix well to ensure each lovely little orb is coated with deliciousness. Pour the chickpeas and any liquid onto a rimmed baking sheet. Don’t use a flat cookie sheet without a rimmed edge or you will have chickpeas all over the place, no matter how steady your hand is. I know this from experience! 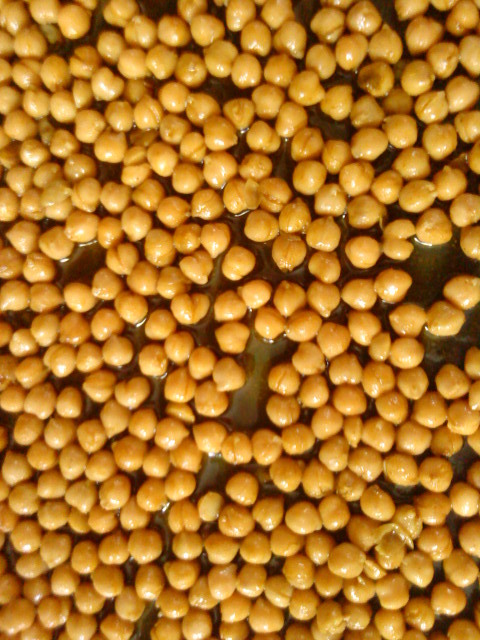 Put the chickpeas into the preheated oven and bake for approximately 25-30 minutes. Wiggle the tray around every 10 minutes or so just to ensure even cooking and so the chickpeas don’t stick to the tray. I like my chickpea bites to still be soft in the centre but crispy on the outside so after 25-30 minutes I put the oven onto broil for about 5 minutes. Watch them carefully because you can quickly gazorch (okay, burn) things very quickly under the broiler. This I also know from testing the reaction time of the smoke alarms. Remove from the oven when they feel crispy and are dark golden brown. They will start to “pop” when they are perfectly cooked to my taste. 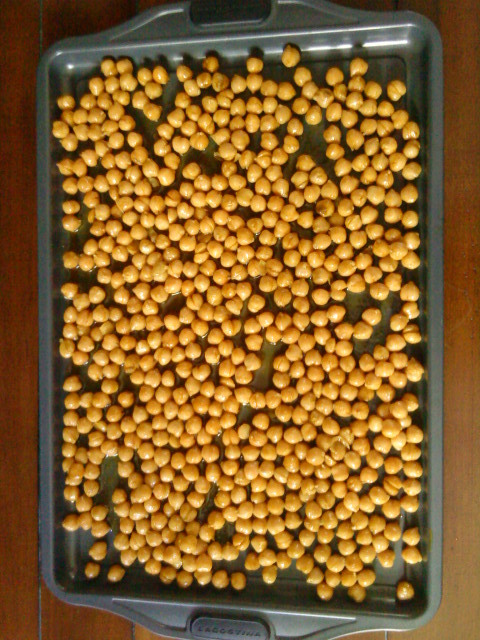 Allow the chickpeas to cool on the tray. Don’t try to eat them when they are first out of the oven. You will burn your mouth. Yup, done that too. Once your mouth is burned you won’t be able to enjoy the yum-factor as much so please try to be patient. Voila! Here is the finished Roasted Chickpea Bites ready to snack upon. Dig in! 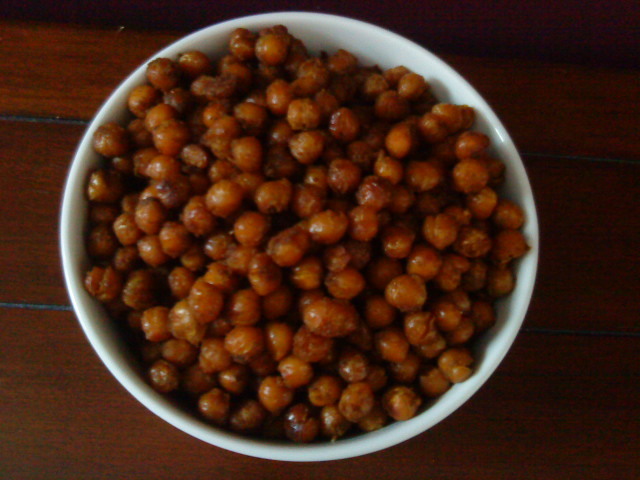 I recommend storing the Chickpea Bites in the fridge once they have cooled down. Since there are no preservatives they will go bad quickly. These are scrumptious cold by the handful or tossed on top of salads. I have always been interested in food. Not just what I ingest, but what others choose to consume as well. I admit that I am a discreet food snob and I am okay with this characteristic. It’s not so much that I would judge another on their choice of food but will judge the food itself against my own standard of quality. For instance, I will always choose a creamy smooth piece of spiced gouda for instance over a processed cheese slice. To me this is common sense. So maybe I’m not necessarily a food snob as I am a seeker of quality. That sounds much better. All of this interest in food consumption has led me down many different eating paths over my lifetime . I am presently a lacto-ovo vegetarian and have been most of my life. I am presently not consuming wheat or sugar as well. I go through phases where I cut out eggs and dairy and abide by a strict vegan diet. I have even gone for a period of time as a raw food vegan and felt fantastic. I was breastfeeding my second child ( my last) during this time and she flourished and is still incredibly healthy. It just wasn’t the right diet choice for my lifestyle after a while. I find, and I’m not sure if this is just me, but living in the climate I am in I felt cold constantly in the winter months so I added some cooked food back in to stoke my internal fire up again. Twelve and a half years later I have had a huge epiphany in terms of eating habits. It is not so much about “belonging” to any one eating regime as it is about providing ourselves with food that our body will be thanking us for. I always knew this, I just seemed to need to identify with a particular lifestyle to feel like I was doing the right thing. Not so much anymore. As you are aware, I have ventured down the road to whole food eating. This, to me, is where it’s at. There is no need to call this lifestyle choice anything but common sense eating. No need to belong to a diet plan title. This is about choosing foods that are not processed and are from the original source be it a fruit, vegetable, oil, or animal product. The further our food gets from the source the more unrecognizable it becomes to our body. There are many within the whole foods methodology that subscribe to the Paleo diet. I am going to give my opinion now so please don’t get your knickers in a twist. Feel free to comment and share your thoughts on this. Like I said, this is my opinion. I don’t profess to be perfect or have all the answers. I only do the things that make sense to me and that feel right. I am a live by my intuition and heart type of person. Here goes…I like the idea of so many people trying to make positive change for their health. I am speaking at present of one of the newest crazes called the Paleo diet. The concept of eating what our systems were originally fed and powered on is very noble. There is one key point missing – is this really how Paleolithic humans ate? Probably not. Common sense would suggest that eating large quantities of meat is probably not the best thing we could be doing for our bodies. Most meat is acid-forming for starters. On the topic of our Paleo forefathers and mothers diet, I am convinced that there was a heck of a lot more starchy vegetation/fruit consumption than the Paleo ideology subscribes to. As I read blogs and articles as well as “studies” regarding Paleo eating it is very evident to me that this diet is an excuse for many folk to eat tons of meat – especially bacon. How does this coincide with our Paleo relatives? Bacon is a form of food preservation/processing that was unknown to humans of old. This is just an example of ideas twisted to suit our desires. If my own vegetarian diet was controlled by my favorites, I would quickly become off balance consuming only aloo gobi and red wine! I read a blog post last week regarding Paleo eating that actually made me sad. The author put the Paleo diet on a pedestal while slamming other lifestyle choices. She went on to flog vegetarianism as unhealthy and extremist. Hmmm….how very unfortunate. There are great ideas at the base of almost all eating styles however, things can quickly veer off course. The Paleo diet is a great idea at its core but has been reworked and altered to compensate for our desires. However, to get right down to the nitty-gritty of eating perfectly Paleo the participant would need to investigate more than just a book written by one person about their idea of the perfect eating regime. In my opinion, the participant would need to first dig into their own personal ancestral past to find out where their origins started. This would give a great place to start whittling down the food choices. If they originated from an ancestral background that resided by the ocean, their diet would be composed mainly of fish and probably sea vegetables. If that aforementioned individual originated from a forested area they probably would have consumed predominantly berries, insects and game such as deer or small birds. I venture to suggest that probably a majority of our ancestors within temperate climes ate with the focus largely on plant matter and enjoyed meat sporadically, not the other way around. This makes sense to me. Just sayin’. Chasing down the animal content of the diet would make a huge difference as well. There is great physical exertion in hunting Paleo-style unlike walking into the grocers and picking up a nicely packaged portion of meat. Then there is the carbon footprint issue. Eating a large quantity of meat in the diet creates unnecessary waste of resources and a higher carbon footprint. If a family of four skips steak one day a week, it will have the same impact as taking your car off the road for three months, supposedly. Not sure how accurate this fact is but it is definitely food for thought. Do you know what your Carbon Footprint is? I am not simply spouting off about the Paleo diet and I am not suggesting vegetarianism is perfect. I am using this as an example due to the blogger that made me question why people make the food choices they do. This goes for all methods of eating as far as I’m concerned. No diet is 100% perfect. Suggesting such is foolish. When a new diet calls itself “the perfect diet” my alarm bells start ringing. The human body is a complex “machine” that relies on us to fuel it appropriately. Each of us has different needs. It can only accommodate so much before we start to see and feel inadequacies. I think if we all just stopped listening to the hype and started listening (really listening) to our bodies we could enjoy a better state of health. I fear the New Year’s ball dropped on my head. I can’t seem to get focused the last couple of days, but not for lack of trying. I have so many ideas and projects swirling around inside my noggin that I am trying to process that I feel like I need a vacation to recoup from the Holidays! Does anyone else feel like this? 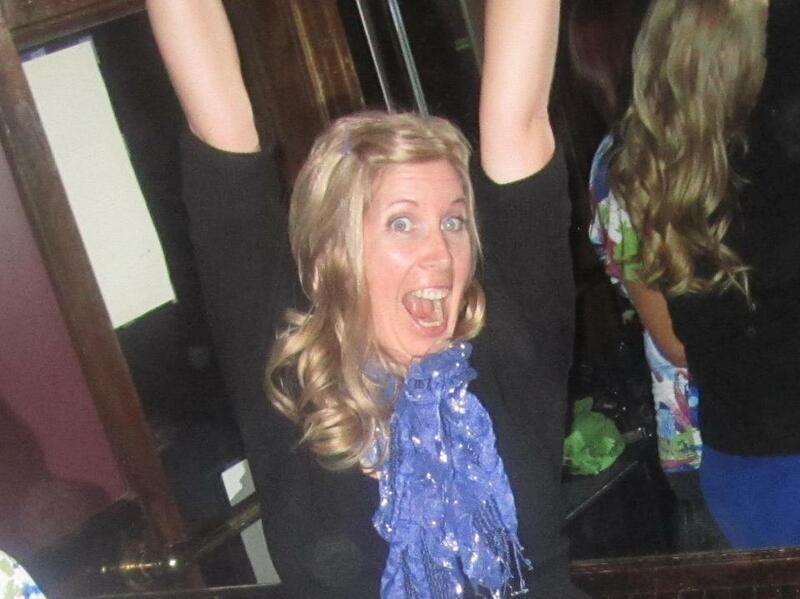 I was excited at saying goodbye to 2012 and welcoming in 2013. I even sat down on New Year’s Day and jotted down my intentions for this year. I started doing this last year and I referred back to my notebook throughout the year. Some of the things I listed were accomplished efficiently while many other points remained untouched. I don’t want to carry over last year’s intentions and feel weighed down by them so I created a new list without rereading last year’s before doing so. There were a few similar items on my lists but the intentions became more focused, less general. A good friend and I were discussing intent a few months ago and she said something that felt like she had hit a gong inside my skull. “If you are general and vague with your intentions, you will get a vague result.” I don’t want wishy-washy results. I want clear, concise results! So, while writing my intentions for this year, I was precise and to the point. It is only as hard as you make it. We have become so conditioned to feel sheepish about saying what we really want; even to ourselves. Don’t be. You are worth wanting to better yourself, to move in a forward direction. There is no shame in accomplishing a goal you have set for yourself or acting on a dream. Put aside ego when you jot down your list of intentions. It shouldn’t be about what others think of you or how much power you hold over others. This should be about allowing your innermost dreams, goals and insight to speak up. I will share one of my goals with you. Like many other people, I like to think of the New Year as a clean slate; a jumping-off point for change. Last September, I made the leap and went 30 days without wheat, sugar or dairy. It was incredible! A few of you took that journey with me and for you I am grateful. It was such a great support mechanism to share the experience with like-minded people. I even made a few new friends out of the experience which made it even better. I lost 22 pounds and went down three pant sizes by changing my food choices. I felt more energetic and healthier than ever before all within a week or so of changing what I was consuming. Over the past month, the omitted items seemed to slowly creep back in. Not to the extent I had eaten them prior to September, but they were still there. I have set myself the goal of kicking wheat, sugar and dairy once again. I started January 1st and can already feel a difference. Pretty powerful. I have 15 more pounds to go before I reach my college weight. I am having a really hard time wrapping my head around this. I never thought I would ever get this close again to that number. I have always tried to maintain the “weight isn’t just a number” mentality. That only works for so many years before I realized that those 15, 20, 50 extra pounds are creating health challenges over the long-term that I have absolutely no interest in. The number on the scale is relevant as long as you factor in other aspects of health as well. I am interested in a sculpted, muscular body not a stick. I would rather have the scale tell me I am a few extra pounds of muscle than it give me a smaller number and not be in optimal health. Partnered with proper fuel (food), this says “healthy” weight to me. So, my goal/intention is to lose the remaining 15 lbs while eating wheat/gluten-free, sugar-free, dairy-free and being active for at least 30 minutes each and every day. Yesterday and today I put away the Christmas tree and decorations and cleaned up any bits left behind. Packing away the signs of the holidays makes me realize that I am no longer in celebratory slow-mo. I need to give my head a shake, flick off the dust, and get a move on. I am primed and ready to meet 2013 with a vengeance – I have dreams and goals to accomplish! I have been doing some deep thinking as of late. Thinking about quality of life in regard to health. What is health, I ask myself. How does my idea of being healthy differ from how others define this state. This forced me to dig a bit deeper as to what being healthy means. I came to the conclusion that being healthy is a compilation of many things. It is not as simple as “feeling good” since that state can be attained by unhealthy means in some cases. So, what have I come up with in regards to the definition of being healthy? Proper fuel: Without proper nutrition we become run down quickly and in some instances cause much more harm than good. I am of the train of thought that the closer to nature that we eat , and supplement, the more our body has to work with. When we pollute ourselves with junk food, our body spends time trying to deal with the invading pollution instead of necessary maintenance and renewal. By ingesting mainly quality fuel we are being diligent in preventing many conditions that are food-related. Movement: Just move it! The more I move, the better I feel. It’s not rocket science. Every little bit counts. I move a lot as a gardener when I am at work so I count these hours as part of my physical fitness time. 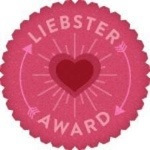 I certainly feel way better lifting heavy objects, digging, planting, dragging, stretching, and so much more than I do when I am being stationary. Hard work is good for the body…and the soul. 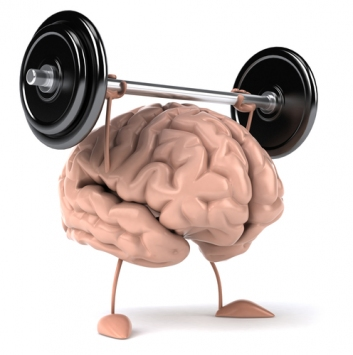 Brain games: Exercising the brain is essential to being alert and “with it”. Reading a lot keeps my brain active as well. No fluff reading here – I want solid material not the literary equivalent of a wet paper bag. I would hope that word and math games assist my brain in being in great shape. I would like to think of my brain as pumped, not limp. 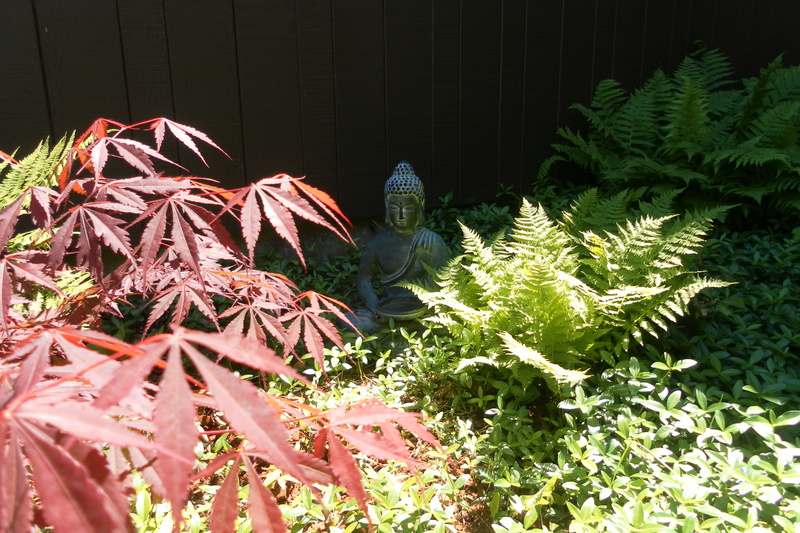 Spiritual practices: I consider myself a spiritual, not religious, individual. Spirituality is unique to each individual and very personal. I am not a fan of debate in this area for this reason. Spirituality is not about foisting your beliefs on someone else, it is about believing in something bigger than yourself and being a part of the flow of existence. Being spiritual is instrumental to great health, I think. It encourages us to not be solely self-focused which can become detrimental to many other areas of our lives. Being in Nature helps me feel centered spiritually. All around us there is incredible life going on in nature instinctively. Positive thinking: This is one of the greatest predictors of being truly healthy. How we view everything around us or the things that affect us can either cause negative, stress-inducing reactions or positive response. Stress = discomfort. No thank you! You know me – I love to try to stay positive! Love: Yes, I said love. We kind of throw the word around a lot. For instance “oh, I love that dress!” Not exactly what I had in mind when I said love. Love connects us to others through emotional channels. When we open our hearts by loving another we feel positive and joyous. Love can also be felt as a peaceful acceptance of existence. Allowing our soul to be in the moment and our thoughts to be gentle and accepting without being judgmental. When our thoughts are bathed in loving energy we allow ourselves to love and be loved with less resistance. Down-time: No person is an island, or something like that. If we are constantly running around stressing ourselves out we are not allowing ourselves the down time that we need…or deserve. I am not suggesting that becoming a couch potato is where it’s at, I am merely promoting some time spent relaxing. Friendship: Feeling connected with others is a wonderful feeling. When we surround ourselves with others that are caring, fun individuals we gain the great benefit of camaraderie. The spirit of friendship is a healthy state to find yourself. It is therapeutic. Next time you are feeling stressed out, have a friend or two over and be silly…you will feel like a weight has lifted. 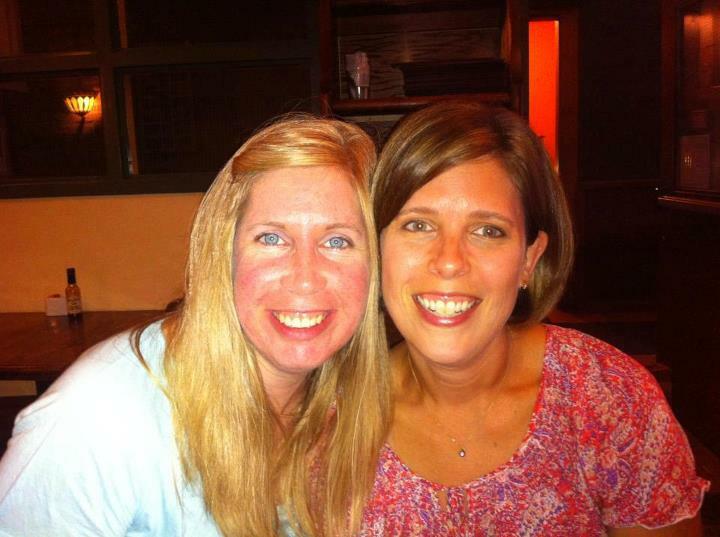 There is a special comfort zone with a fabulous friend that you just won’t find anywhere else. Your health depends on close friendships with others. Life-long friendship is a gift. Play: Please include play into your personal health regime. Jump in a pile of leaves, go bowling, see if you can still jump rope like you used to, have a snowball fight…whatever you feel like at the moment. Laughter keeps us youthful and in touch with who we are. No need to be all stiff all the time – smiling and laughing makes everyone more beautiful; inside and out. Yes, that’s me having fun, fun, fun! In my mental quest for my personal definition of health, these are the areas I feel are imperative. I am certain that more will be added along my life path and my hours of mental musings. So, enjoy great health by giving your body, mind and spirit the respect they deserve. Health isn’t merely being free of disease – it is about living each moment to its fullest and being proactive! To follow-up the Thanksgiving themed posts, I will wrap it all up with one last post…the menu. Sadly, I have no pics to add to this delicious food bonanza except a photo of the last piece of gluten-free, dairy-free pumpkin pie. I think I will be making another pumpkin pie in the near future since this was such a hit. I never use a recipe for squash soup. Or most of the soups I make, for that matter. I start by heating up a couple tablespoons of oil in a large soup pot and add in a couple of medium-sized, chopped onions. I saute the onions until they are just starting to brown slightly to give some added flavour. At this point I toss in an entire butternut squash (medium size) that has been skinned and cut into large pieces of about an inch or so cubed. Drop in one large sprig of fresh rosemary (you will remove the stem before blending soup) or remove leaves from stem and chop finely. Pour approximately 8-10 cups of vegetarian stock into the soup pot and simmer for approximately 45 minutes to an hour until the squash is very tender. At this point, puree in small batches in the blender until very creamy and smooth or use an immersion blender. The silkier the soup, the better. This soup can be made to serve immediately or even a day prior to serving. I think the soup tastes better the longer it rests. I really love Brussel sprouts. They have always been one of my favourite foods but until recently I have always had them served boiled. My sister made them a couple of years ago sautéed and caramelized with brandy. Oh…my…GOSH! I learned to love them even more! I have made them since then a few times following her method but for Thanksgiving dinner I simply steamed them in a saute pan then removed the lid, added a bit of ghee and let them do their thing until they were nicely golden and sweet. Mmm, mmm,mmm. Early on the morning I would be needing the roasted garlic I sliced of the top off of a head of garlic, set it on a square of foil, poured a bit of olive oil over top and sprinkled with freshly ground black pepper. I then wrapped the foil tightly around the garlic and popped it in the toaster oven until it was fragrant and soft. I set it aside until dinner prep time when I squeezed all of the luscious soft cloves from the bulb and dropped them into the pot of cooked and drained potatoes. I got busy and whipped the potatoes and garlic with vegetarian stock instead of milk and butter to make them lighter and much easier on my figure. Yummy, sweet rutabaga…how I love thee. Usually I hear mass rebellion at the presence of rutabaga at our table so I don’t serve it often. I decided to go “old school” and boil and mash it but with the twist of real Canadian maple syrup and ghee added instead of butter and brown sugar as my mom prepares it. The kids decided that rutabaga can be delicious so I will no longer have the entire bowl to myself. For this, I am grateful. Of course the recipe for stuffing that I have made in the past that I love had conveniently disappeared right before I needed it, so I had to wing it. A loaf of crusty, day old bread was ripped into bite-sized pieces and put into a 13 x 9 Pyrex dish. In a frying pan I sautéed cubed celery and onion until translucent then poured them over the bread. I also added in herbs (dried thyme, marjoram, as well as fresh chopped rosemary) , one egg, salt/pepper and some hot stock until it seemed moist but not sloppy and drowned. Stir everything around gently so the bread doesn’t turn into mush. The pan was covered with foil and put in the oven at 350*F for about 40 minutes. I then took off the foil to crisp the stuffing slightly for another 20 minutes or so. Watch that it doesn’t burn. Sometimes I add onions or mushrooms to gravy but I opted for no-fuss good old plain gravy that is certainly not boring. I start with either coconut oil or ghee and add about a tablespoon of quinoa flour into the hot pan and stir so as to not burn the flour. Once the flour starts to colour slightly, I add about 2 cups of vegetarian stock and stir with a whisk to remove any lumps. Stir until the gravy thickens. Voila…easy homemade gravy! After acquiring a whole chicken, which wasn’t an easy task at a time when turkeys are all the rage. I am rather squeamish when it comes to dead animals so this was the tricky part for me. The bird was rinsed under running water then a mixture of dried herbs (fresh lemon thyme and rosemary), about four slices of lemon, and a couple of cloves of garlic were put into the cavity. I brushed melted butter oven the outside of the chicken for an extra layer of flavour. The chicken was lovingly placed into my cast iron casserole with lid and placed into the oven at 350*F for about and hour and 20 minutes. I had to hunt down the proper amount of time for cooking a whole chicken since it is not something I do regularly. I learned that a chicken needs to be cooked for 20 minutes per pound for a perfect roast chicken. After the allotted cooking time, I removed the lid of the casserole dish to brown the skin slightly. The house was really smelling amazing at this point. After reading a fantastic post with a recipe for homemade baked beans by a fellow blogger, I knew I had to try her recipe. Wow, I’m so glad I did! It was scrumptious! You can check out her recipe here: Homemade Baked Beans. This was another “first time” recipe for me and I am so glad I decided to give it a try! It was excellent and has already claimed a place in our Thanksgiving meal for next year. I highly recommend this recipe – Gluten-Free, Dairy-Free Pumpkin Pie. Is there anything more nostalgic than pumpkin pie and whipped cream when it comes to Thanksgiving? Not in my mind there isn’t. To make my life easier I always use my Kitchen Aid stand mixer to do whipped cream. This way I can do my usual ten other things while the cream is being fluffed full of air. Pour the whipping cream into the mixing bowl, add a couple of tablespoons of real maple syrup (no fake maple-flavored crap here) to the cream as well as about a half teaspoon of real vanilla extract then turn on the mixer and leave your hands free for other tasks. Once the whipped cream is the desired thickness turn off and place in a bowl for those around your table to serve themselves their desired amount instead of dolloping it on top of the whole pie before serving. I find the amount of whipped cream varies from person to person so allowing others to do their own is not only fun for the kids but for the adults too. I have always found it curious that Canadian and American Thanksgiving celebrations are so far apart on the calendar. I am looking forward to hearing how our friends to the South celebrate their Thanksgiving once it rolls around. I think this year’s Thanksgiving weekend ranks at the top of my Thanksgiving memories. The weather was incredibly beautiful and autumnal. One evening being cool and rainy was a great excuse to bundle up inside with a glass of red wine, a cozy blanket and an interesting documentary. What? I love a good documentary! Monday morning the sunshine and crisp air beckoned us outside to get the garden prepped for winter. There was raking to be done and the removal of the veggie garden plants. The whole family chipped in on the task which made it so much more enjoyable. We had some good laughs while working as a team to accomplish a goal. Things went slightly awry when the kids thought it would be fun to chuck green “grounder” tomatoes at each other. They quickly realized it wasn’t as intelligent as originally thought once put into action. 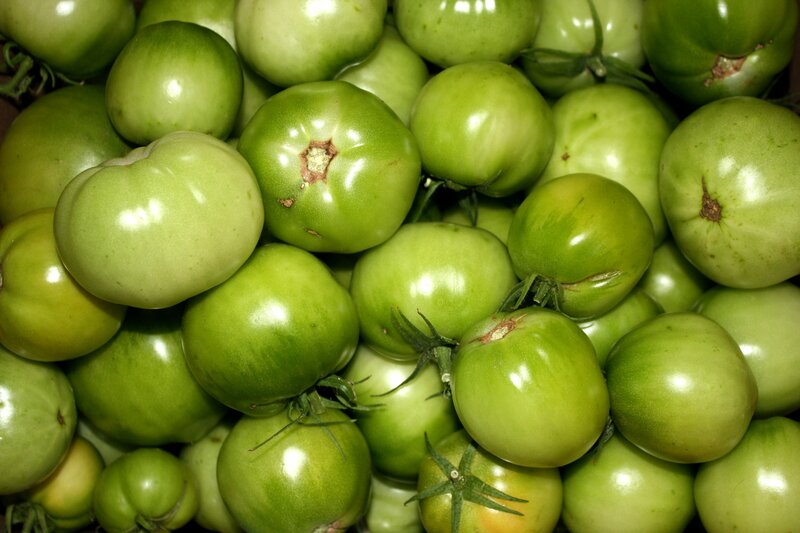 A learning lesson was had – being pummeled with green tomatoes is like having rocks thrown at you! Those shenanigans died down without me even having to pull out the “safety first” speech. We indulged in our quiet Thanksgiving dinner on Sunday evening and reported to each other something we were thankful for. I stated that I had a few things on my list and was quickly shut down after three. Well! (Insert huffy breath here.) I was trying to keep it brief. I didn’t even ramble. I guess everyone was just incredibly thankful for the good and plentiful food set before them that waiting to consume it was a hardship. I had prepared everything healthier and lighter with a whole food mindset although I don’t think anyone even noticed that all the “unnecessary stuff” was absent. All I heard was a resounding “thank you for a great dinner”. Chalk one more up for eating clean. After mentioning in my last post that I would be making a wheat-free, dairy-free pumpkin pie there was some interest shown as to how it would turn out. Truthfully, it was delicious. I have made pumpkin pie in many variations over the years and I think this has to be one of my favourite methods. I didn’t feel that drive to overeat or the icky feeling from too rich of a dessert. I have tried everything from store-bought to tofu pumpkin pie to made from scratch using local pumpkins. This year’s was the winner! A co-worker/friend of mine came across the recipe and thought it looked like something I would be into so she posted it on my Facebook page. So glad she did…thank you. There seemed to be a lot of kitchen activity this weekend and I even managed to stock the fridge with lunches and snacks for the next few days. We started the day yesterday with quinoa crepes with fresh, hot applesauce and real Canadian maple syrup… Mmmm. Yesterday I whipped up another new recipe to me – Banana Prune Cake. Very yummy and not too sweet. The prunes were supposed to be dates but I only had prunes so I substituted. Last night’s kitchen adventure was a speedy home-made hummus with extra garlic. Sorry to every one of you in advance that I am in close proximity to over the next few days. I pumped up the garlic amount in an effort to try to rid myself of the lingering sinus/ear annoyance I have been fighting for the past week. All in all, this Thanksgiving was wonderful and reaffirming of the blessings of Life. Sharing healthy, delicious food, enjoying nature, and being with those I love has made beautiful memories and a warm fuzzy feeling in my heart. Here in Canada, Thanksgiving weekend has arrived. I love this time of year. After Christmas I would have to say that Thanksgiving is my favourite “holiday”. 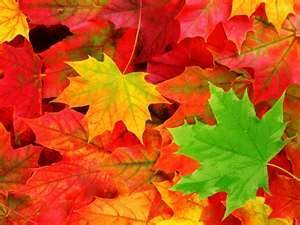 The chill in the air, the delicious smells wafting from kitchens and the incredible autumnal colours. This year, Thanksgiving is shaping up to be different from in the past. I have decided to lie low this year and simply take it easy at home with my kids. No huge dinners, no crazy running around, and definitely no travelling on jam-packed highways for hours only to spend a few hours at a table stuffing ourselves silly. We are enjoying each others’ company and loving the simple things like raking the leaves together, choosing a pumpkin, and cranking the tunes and singing like lunatics. Good times. Our Thanksgiving dinner this year is veering slightly from the traditional. After starting a healthier way of eating at the beginning of September, I am shaking things up a bit by losing the mass amounts of unnecessary sugar, wheat and dairy that usually accompany large meals. Our Thanksgiving meal will start with a butternut squash soup followed by the main entrée. Instead of turkey, a whole chicken has been requested so I will be making a herb roasted chicken as well as homemade vegetarian baked beans for us veg-heads. The side dishes will be plentiful – carmelized Brussel sprouts, whipped garlic potatoes, rutabaga, and homemade stuffing. 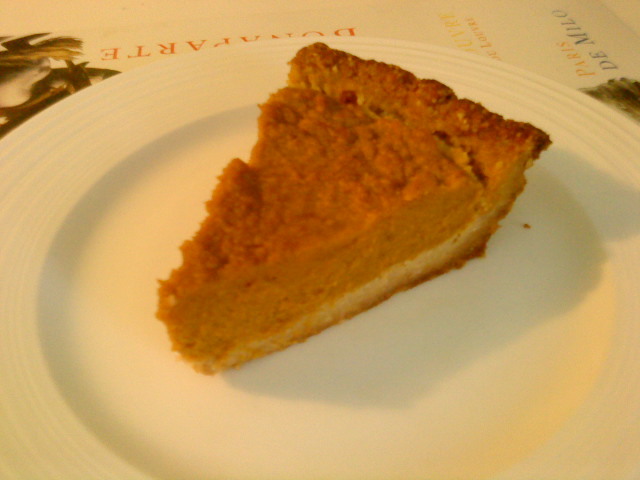 For dessert I have decided upon a gluten-free, dairy-free pumpkin pie that my mouth starts to water at the thought of. It sounds as though I will be busy in the kitchen slaving away. To me I am content and happy making healthy food to nourish my family. I have always felt that when we cook for our self and our family with love and kindness in our heart the food we prepare will be nurturing and full of love. I have so much to be thankful for this year. I won’t bore you with my list that goes on, and on…and on. Instead I will turn the corners of my mouth up into a smile and let my heart be wide open with love and gratitude for the goodness that I have been blessed with.